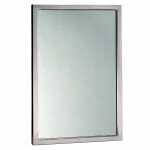 Bobrick B29081836 B-2908 Series Welded Frame Tempered Glass Mirror, 18" X 36"
B-2908 Series Welded Frame Tempered Glass Mirror, 18" X 36"
* Please note that tempered glass mirrors are engineered for heavy traffic, vandal-prone restrooms in K-12 school buildings, stadiums, outdoor recreation centers and low-supervision facilities such as parks and highway rest stops. Tempered glass mirrors resist breakage and provide a measure of safety from broken glass, but differ in color and reflective quality from standard glass mirrors. Bobrick uses the highest quality tempered glass mirrors, however modest distortion or heat-generated markings are normal in the tempered glass mirror manufacturing process. Therefore, Bobrick will not accept returns of tempered glass mirrors with random distortion or markings. 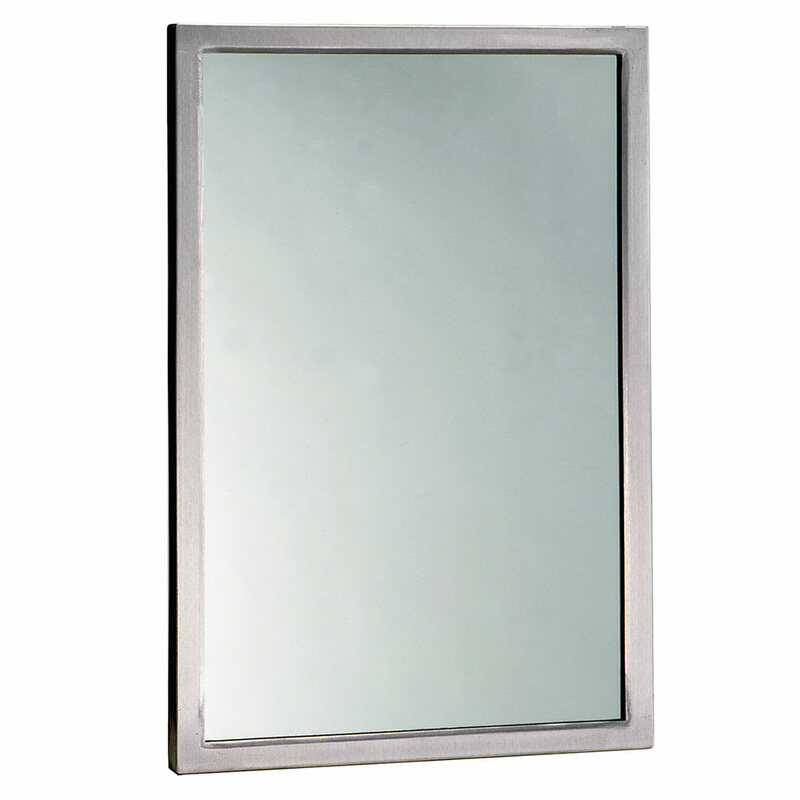 B-2908 Series Welded Frame Tempered Glass Mirror, one-piece roll formed 3/4" x 3/4" angle frame, type 304 stainless steel angle with satin finish, corners heliarc welded, ground and polished smooth, beveled frame edge at mirror for imporved appearance. Mirror consists of 1/4" tempered glass. Lock Tab design with multiple "I" brackets. Please note that tempered glass mirrors are engineered for heavy traffic, vandal-prone restrooms in K-12 school buildings, stadiums, outdoor recreation centers and low-supervision facilities such as parks and highway rest stops. Tempered glass mirrors resist breakage and provide a measure of safety from broken glass, but differ in color and reflective quality from standard glass mirrors. Bobrick uses the highest quality tempered glass mirrors, however modest distortion or heat-generated markings are normal in the tempered glass mirror manufacturing process. Therefore, Bobrick will not accept returns of tempered glass mirrors with random distortion or markings. Current Item: Bobrick B29081836 B-2908 Series Welded Frame Tempered Glass Mirror, 18" X 36"
Bobrick B29082436 B-2908 Series Welded Frame Tempered Glass Mirror, 24" X 36"